PEARL, MS - The Atlanta Braves have announced their 2018 Minor League Award Winners. 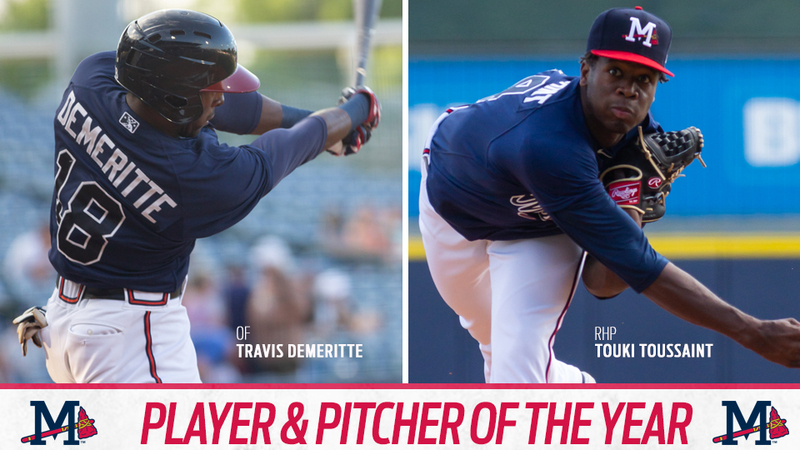 Mississippi Braves outfielder Travis Demeritte was named the M-Braves' Player of the Year, while right-handed pitcher Touki Toussaint was named Mississippi's Pitcher of the Year. Toussaint also received the Phil Niekro Award for Braves Minor League Pitcher of the Year, and former Mississippi third baseman Austin Riley received the Hank Aaron Award for Braves Minor League Player of the Year. Demeritte, 23, led the club in home runs (17), extra-base hits (44), RBI (63), total bases (178), runs (69), games (128) and walks (57). His 44 extra-base hits ranked tied for fifth in the Southern League. Demeritte became the first M-Braves player to record 17 home runs in a season since Ernesto Mejia hit 26 during the 2011 season and also became just the fourth M-Braves player since 2005 to record 16 homers in a single season. The Atlanta Braves No. 22 overall prospect is now Mississippi's all-time home run leader with 32 long balls over the 2017 and 2018 seasons. Drafted originally by the Texas Rangers in the first round (30th overall) of the 2013 draft out of Winder-Barrow (GA) HS, the Rangers traded Demeritte to Atlanta on July 27, 2016. Demeritte excelled this season in clutch situations, proven by his .294 batting average and 14 extra-base hits with runners in scoring position. He was named M-Braves Player of the Month by the organization in August after batting .265 with five home runs, four doubles, one triple, 14 RBI, 19 runs plus a .371 OBP. Demeritte opened the season by going 1-for-28 but finished the month of April going 13-for-40 (.325, (2) 2B, 3B, 2 HR and 7 RBI from 4/15-4/30). Demeritte concluded the month of May by batting .280 with seven doubles, one triple, three home runs, 15 RBI, 14 runs, 15 walks, .382 OBP and .855 OPS in 28 games. The Georgia native recorded his first two-homer game and ninth of his career on August 9 at Jacksonville, scoring a career-high five runs, finishing 3-for-4 with two homers, four RBI, five runs and two walks. Demeritte hit three home runs and scored eight runs over a three-game stretch, August 9-11 at Jacksonville. Toussaint, 22, made 16 starts for the M-Braves in 2018 going 4-6 with a 2.93 ERA (28 ER/86.0 IP), 36 walks, 107 strikeouts and a .208 opponents batting average. Toussaint led all Braves' minor league pitchers with a 2.38 ERA (36 ER/136.1 IP) and ranked tied for eighth in MiLB in strikeouts (163), going 9-6 in 24 starts between Mississippi and Gwinnett. He posted the second-lowest ERA in MiLB after June 1, a 1.33 mark (12 ER/81.0 IP) that trailed only Patrick Sandoval of the Southern League's Mobile BayBears (1.16 ERA, 10 ER/77.1 IP). Toussaint was promoted to Gwinnett on July 5 and went 5-0 with a 1.43 ERA (8 ER in 50.1 IP), a .193 opponent average and six quality starts in eight outings. The Pembroke Pines, FL native is one of 12 M-Braves alums to debut this season, and one of four starting pitchers. Toussaint made his made his major league debut in the first game of a doubleheader, August 13 vs. Miami, tossing 6.0 two-hit innings, allowing one run and two walks while fanning four. The No. 7 overall prospect for the Braves became just the third Atlanta pitcher over the last 110 seasons to go at least 6.0 innings and allow no more than two hits in his debut, joining James Parr (9/4/08 vs. WSH) and Armando Reynoso (8/11/91 vs. HOU). By earning the win in his major league debut, Toussaint became the third Braves starter to win his MLB debut this season, joining former Mississippi hurlers Mike Soroka (5/1 at NYM) and Kolby Allard (7/31 vs. MIA). Riley, 21, hit .333 (33-for-99) with 10 doubles, three triples, six home runs, 20 RBI, 17 runs scored and a 1.071 OPS over 28 games to begin the season. Riley hit two home runs on April 12 at Biloxi. The Mississippi native also became the first M-Braves player to record two triples in one game since Ozzie Albies did so on April 17, 2016, against Chattanooga. Riley recorded his two-triple game on April 18, 2018, vs. Pensacola. Riley was promoted to Gwinnett on May 7. He combined to bat .294 (120-for-408) with 30 doubles, three triples, 19 home runs, 61 runs scored, 70 RBI, a .522 slugging percentage and a .882 OPS over 108 games between Mississippi, Gwinnett and the GCL Braves. Riley was the Braves' Competitive Balance Round A selection (No. 41 overall) in the 2015 MLB Draft out of DeSoto Central High School in Southaven, Miss. Last season the M-Braves were represented by Ronald Acuña Jr. and Mike Soroka as Braves Minor League Player and Pitcher of the Year.